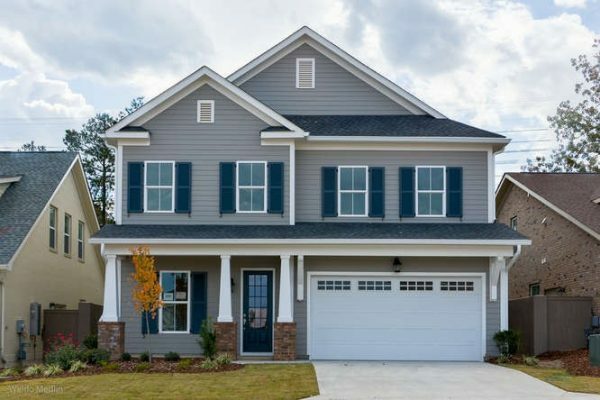 If you have been looking for a spacious home for your growing family, a place where you can celebrate old – and create new – family traditions, and you are ready to make a decision quickly, please visit this beautiful new home in Saluda River Club’ Woodlands District. Located at 645 Tailwater Bend, the 4 bed, 3.5 bath house built by Lifestone Residential provides a warm welcome to family and friends who will enjoy the warm and welcoming home’s spacious downstairs. There’s lots of room for parties and get-togethers, not just during the holidays but year-round! To maximize the gathering space, the only separation between the main living areas is marked by detail work on the tall ceilings. The exceptional kitchen features luxury stainless steel appliances, a gas cooktop and a generous granite-topped island that anchors the room. With this much space, it’s the perfect spot for kids to do their homework, or for pouring friends a glass of wine while you put the last touches on a festive dinner. Storage is no issue in this 2,970 sq.ft. home. The kitchen has been designed with plenty of custom cabinets, and the dining room features an additional wall of cabinets – for treasured family heirlooms, crisp table linens and your fabulous wedding china. During the colder winter months, homeowners will enjoy the cozy gas fireplace in the adjoining family room. The kitchen and family room both have huge panel doors (two doors and two windows in each room) that overlook the outside living area and the screened-in porch. There is also a large den downstairs that would be quite suitable for a home office, or for a craft or media room. The floor plan of this home, called The Saratoga, includes four bedrooms upstairs. The elegant master suite has been designed with convenience in mind. There are two large walk-in closets, access to the laundry room, and a well-designed master bath with water closet, soaking tub, separate vanities, tile shower and a linen closet. This home is available now for immediate move-in. Nestled in the Woodlands District, Saluda River Club’s newest neighborhood, it offers both impressive privacy as well as complete access to all shared amenities within the Saluda River Club community, the most successful residential community in South Carolina. To learn more about The Saratoga at 645 Tailwater Bend or to schedule a private tour, please call 803-358-3969 or visit www.saludariverclub.com.